This week I'm bringing back my easy cauliflower dip! After the holidays the last thing I want to do is spend too much effort in the kitchen for snack time. Here is a "healthy" and tasty dip. Super great idea, my 2 year old loves to dip things and this really would be perfect to get veggies into her "dipping"
mr. pineapple man - sausages? Jennifurla - It's funny letting people try it before telling them what it is. They do like it though. It's perfect for kids. That's the way to eat cauliflower! My kids would never even know it was veggies. Happy NEw Year to you Lyndsey! Love your healthy dip! Lindsey, This looks great and healthy. It's perfect for kids! Great looking sausages:)...Dip sounds good too...I think I'd prefer it with the curry instead of the ranch. That dip is healthy and delicious! New Year is the time to unfold new horizons & realize new dreams, to rediscover the strength & faith within u, to rejoice in simple pleasures & gear up 4 a new challenges. Wishin u a truly fulfilling 2011 Lindsey! I was on that South Beach diet years ago...and made the cauliflower "mashed potatoes". Love how you've made it into a dip, Lyndsey! I'm thinking Super Bowl here. That is a great idea to eat cauliflower!!!! Enjoy everyone & have fun! Rhondi - You got it! My daughter likes it... and so do I! Thanks for adding to tailgating Time! Ramona - Thank you, Happy New Year to you too! Anncoo - Thanks! and thanks for joining in Tailgating Time! Bo - thanks the sausages do look good :P I like it with curry better too, but kids seem to like it with ranch! Sutapa - thank you for such a nice comment. Wishing you the best in the new year! Barbara - I like the South Beach "Mashed Potaotes" too. This dip tastes good cold, believe it or not! Kristy - Wow! Two dishes, and they both look great! I wish I could taste them for real and not virtually. I know...I'm bringing out some good ol' stand by recipes! 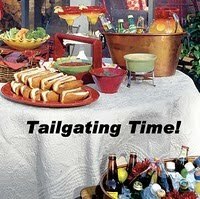 Oh, how fun...a tailgating party! Your cauliflower dip sounds light and delicious! I love cauliflower mash so I can imagine how delicious this is! Love cauliflower and this is absolutely new for me..Happy New year,Lyndsey !! What a great way to serve cauliflower; wish I could go to your party; we are in deep snow up here. Biren - So happy that you joined us! Can't wait to try the brown rice couscous. Simply Life - you can join the fun! Kathleen and 3 Hungry Tummies - This is fun to expirement with some other flavors. I think maybe adding yogurt with some spices would be a nice dip. Gulmohar - I really enjoy cauliflower too, thanks you have a happy new year too! Rita - Come on down and join us! I'll whip up some more dip! Happy New Year Lyndsey and all the very best. Mmm... this looks really good. I love cauliflower anything. I make pureed cauliflower with olive oil as a mashed potato substitute. We don't have tailgate parties, being in Mexico. Our football comes via satellite TV, but I always fix treats for game time.